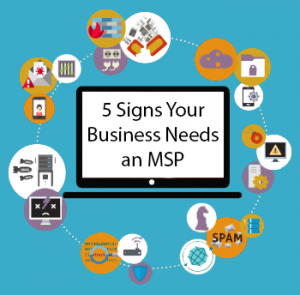 You might not be sure if you need a Managed Service Provider (“MSP”), like Networks Unlimited, but here are five signs that your business might want to start looking for an MSP. If your current IT staff is so overwhelmed with fixing items constantly, they might not be getting the chance to work on preventative maintenance. Without preventative maintenance, your business network will get worse, and problems will get bigger. Partnering with an MSP means your staff will be able to focus on the big picture, while the MSP’s team fights those fires. Networks Unlimited’s AnswerIT service allows your business to call when your staff needs them and only be charged for those calls, or you can pay a monthly fee and get unlimited help desk support. Do you have a lot of little things that continually happen to your technology? You might be so used to them that you don’t even think of them anymore, but if you thought about them all at once, you’d realize you small technology problems have become a big issue. Don’t allow yourself or your team to be constantly bogged down by little inconveniences. Allow an MSP to come in and fix these problems, and think about future issues to fix before they become problems. We understand that team in small companies have to wear multiple hats. It is just a standard way of life, but are you overworking your talented staff and keeping them from focusing on their primary job duties? Just because you have a staff member that can fix technology problems, doesn’t mean they want to be doing it forever. It might be time for you to allow an MSP to manage your data backups, or keep track of those Microsoft licenses, or add and delete users from your network. Don’t wait until your staff is fed up with their workload before letting them focus on their primary job duties. Your tech staff is probably fantastic! Everyone at the office loves them. They have been able to solve every problem that has ever come up. You’re happy, right? What happens when you move buildings, get new software, or have a significant infrastructure update? Even the most talented and capable person or team has areas where they don’t know everything. When your staff needs assistance is the perfect time to call in an MSP. We are here to supplement your fantastic staff to make sure that your projects get done promptly, and your team doesn’t burn out trying to figure out something from scratch. Networks Unlimited has a Project Manager who can direct all aspects of your project to get it completed within the timeframe given. Business is a lot easier when you know what costs are coming up and you can plan for them. Having an MSP allows you to do precisely that! Our monthly billing means that you know what to expect from your IT, and how much it will cost every month. We can also help you plan for upcoming expenses that are larger than usual, by giving you an indication when hardware should be replaced and then you can start scheduling those items and preparing for them. It doesn’t matter if you’re a small business just starting out, or a large organization that has its own IT staff, Networks Unlimited can help you achieve your goals! Contact us today to get started.